One of the many ways we’ve written through which netizens and business minded individuals can make money online is by doing affiliate marketing and not just Affiliate marketing but Jumia Kenya sales affiliate marketing. Jumia Kenya which is an online shopping website was launched in Kenya in March 2013. It is considered as one of the biggest online shopping websites that sell different products ranging from clothes to electronic devices in Kenya. Jumia’s affiliate program is one of the few online affiliate programs available directly to Kenyans which pays directly to them in the local currency and so unlike other affiliate programs such as Amazon or Clickbank, you don’t even need to have a PayPal or other online payment wallet in order to receive your earnings. What are cookies and How long do they last? Well, those who know about affiliate marketing will know a thing or two about cookies. It’s like a bit of data that contains information about your referrals and it helps your merchant remember that this particular referral clicked on your website last before making a purchase. The good thing is that the cookie lifespan for Jumia’s affiliate program lasts for up to 30 days. This means that, even if your referral doesn’t buy something from Jumia on the same day that they clicked on your affiliate link but do so at a later date within the 30 days lifespan of your cookie, you’d still get credited. The affiliate commission model for the product you are promoting. With the many affiliate programs in Kenya, Jumia Kenya sales affiliate is considered as one of the best because of their higher commission structure. See the Jumia affiliate commission model below. According to the commission structure above, if you refer someone to visit Jumia Kenya online store to buy products from the Home and Living products category, they will pay you 7% commission. Different product categories have different commission structure. The highest commission structure is the fashion category. And that’s why you will make a lot of money if you start a fashion blog. To join Jumia affiliate program, follow the instructions below. Fill in the Jumia affiliate program signup form provided. Select your account type ( I prefer individual), fill in your name, email address, mobile number, country of residence, and your website. After filling that information, proceed to read their affiliate program terms and agreement. Agree to their terms, and then Click on the “START EARNING” button. Login to your email address to confirm your email address by clicking a confirmation link sent to you. After submitting the form, the Jumia Kenya affiliate team will review and process your application. It usually takes about 4- 5 days to get their response. The affiliate team will check your website/blog URL to confirm if you have enough traffic to promote their products. If your application is rejected, you can appeal for acceptance by contacting them through their affiliate email: [email protected] and explain how you will promote their products. This is what I did when they first declined my application. 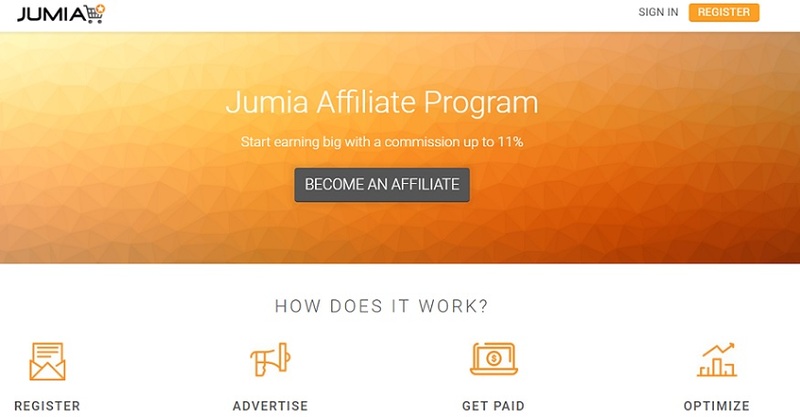 After you have been approved by the Jumia Kenya sales affiliate program team, You need to start promoting their products and earn some commission if you have enough traffic on your blog. Jumia affiliate links have unique identifier codes that inform Jumia Kenya sales team that it’s you who referred someone to buy the product. The system, therefore, tracks your referral links and credits your commission with the agreed commission rate. To generate affiliate links for a specific product or product category you want to promote follow the instructions below. Get the Product Link – Visit Jumia Kenya website and get the product link of the product you want to promote. Select the “Advertising Offer” i.e country of interest for our case, its Kenya. How to Insert Jumia Kenya Sales Affiliate Links on your Blog post. Jumia Kenya affiliate links are just like any other links and can be inserted into blog posts by using the “Add Link” option on WordPress or Blogger “Insert/Edit Link (Ctrl+K) on your keyboard. Click on “Tools”> “Banners” and select “Advertising Offer” i.e country of interest. If you are in Kenya, select Kenya. The Jumia banner code is to be placed on your blog or website for the advertising banner to appear. I’ll show you how to place your ads banner on WordPress and Blogger respectively. Select a text widget on your sidebar and paste the Jumia banner code. Save it and you are done. You should be able to see the Jumia banner ad appearing in the place you put the banner code. If a blog user clicks and makes a purchase from the banner link above, you receive a commission. Once you are set and have promoted some Jumia products on your site, you may start getting conversions and which results in qualified sales. You can, therefore, use the Jumia Kenya affiliate dashboard to view your commissions and know how much you have made during s certain period of time. Although it’s difficult to understand their reports, you can monitor your sales on a daily basis. To check your Jumia affiliate promotional report, Log into your Jumia affiliate account and select your Country under “Products Overview” on your dashboard to view the reports and progress for a single day, week or month. For a more detailed sales conversion, Click on “Reporting” > “Conversions” from the left vertical menu. Choose your country promotion target and then select the desired period of time from which you will be able to view the number of sales made. Jumia Kenya pays either via direct Bank transfer or Mpesa. In order for you to receive payments, you have to provide either your Bank account or Mpesa details on your dashboard. Just like any other affiliate marketing programs, you need to follow and play by the rules of the game as stipulated in this article. You should then be able to grow your blog site to a level where it can really make more money for you. I would recommend using a products review blog to make money from Jumia affiliate. a products review blog is where you talk about various products sold at the store. Rafa'el is an Engineer/Entrepreneur who loves turning everything he finds interesting into hard cash, including conversations and directions. UrbanKenyans is that online platform where Kenyans from around the World Share and get informed.